1. Scoop out the inside flesh from the potatoes leaving a 2cm walled potato cup. Discard the flesh and set potatoes to one side. 2. Brown beef mince and onion. Add the Slow Cookers Beef Chilli Con Carne recipe base to the tomatoes and beef mixture then stir through. Stuff the beef mixture into the cavity of the potatoes. 3. Place the filled potatoes into the slow cooker insert pot and pour the water into the bottom of the insert pot. 4. Cover and cook for 4 hours on HIGH or 8 hours on LOW. (Keep covered during cooking. Cooking times may vary between Slow Cooker models). Serve topped with grated cheese and sour cream. This entry was posted on September 6, 2010 at 6:53 am and is filed under Cooking, Recipe. You can follow any responses to this entry through the RSS 2.0 feed. You can leave a response, or trackback from your own site. Oh my so many new things for me to try this week when I’m cooking…thanks! Potatoes. Lots of potassium. Thank you for this nutritious recipe. 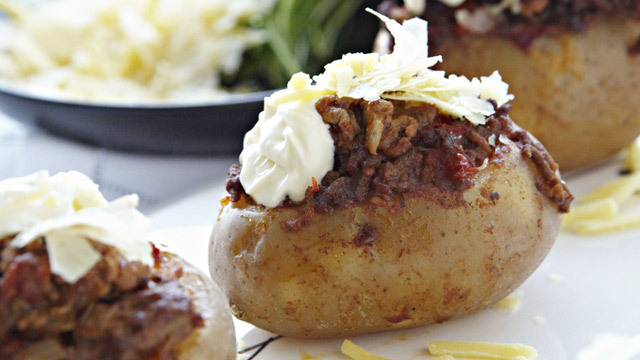 How simple to cook them in the slow cooker! Blessing to you across the seas! u may already have these, it is okay to ignore in case u don’t want them. looks yummy.. Me being a vegetarian.. am going to replace beef stuffing to cottage cheese with onion and tomatoes..and try it out..
My mouth is WATERING!! Will definitely add this to dinner ideas list! This is a nice idea. Tasty. Budget wise. Not a lot of clean-up. What more could we want!